The past several years I have written in November about snowflake cufflinks - the platinum and white gold cufflinks that sparkle with intricately engraved patterns. It was sort of an impromptu celebration of the coming Winter. But, this year November has been a little too gray and chilly. So, I thought a discussion of colorful cufflinks might help dispel the coming winter blues. This month we feature cufflinks set with beautiful colored gemstones and rich jewel-like enamels. Regal blue guilloche enamel cufflinks. 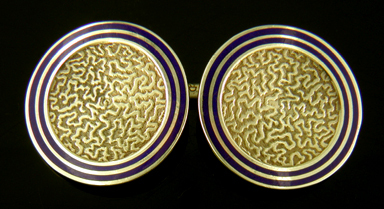 Among cufflinks brightened with fine enamel work the most intriguing are the guilloche enamels. The process for creating these miniature masterpieces was as involved as the finished jewels are beautiful. First the cufflinks were engraved with a mesmerizing design of radiating curves and intertwining lines using a technique known as "engine turning" or "guilloche". The intricately engraved tops were then covered with a translucent colored enamel. The vitreous luster of the enamel and depth of color along the engraved lines served to throw the engraved pattern into stunning relief. 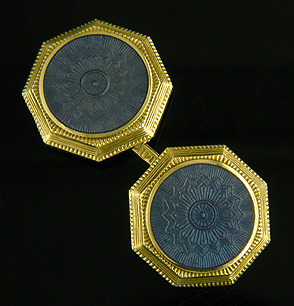 The elegant blue and gold cufflinks pictured above are a wonderful example created by Taylor & Company around 1925. The pair of Carrington cufflinks illustrated at the beginning of this note is a second striking example of beautiful guilloche enameling. Larter blue enamel and gold cufflinks, circa 1930. Boldly colored enamels also served as accents and borders. The above Larter & Sons cufflinks feature alternating royal blue enamel and gold bands which frame richly textured centers teeming with golden squiggles. A design we have nicknamed "Infinite Squiggles". The regal elegance of the blue enamel beautifully complements the warm texture of the gold. Art Deco cufflinks, circa 1930. Two hallmarks of Art Deco design were bold geometry and dramatic color. The cufflinks pictured above are a nice example of both. 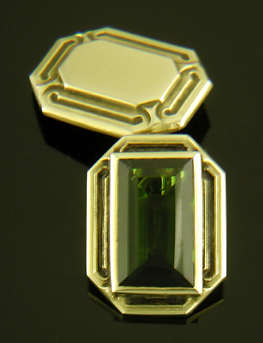 The intoxicating color of the emerald-cut Tourmaline is matched by the bold, geometric gold work. A wonderful example of Art Deco design. Created by Larter & Sons in 14kt gold, circa 1930. Carrington carnelian and gold cufflinks, circa 1925. A second pair of Art Deco era cufflinks with exuberant color. This dramatic pair features cabochon-cut Carnelians that glow a sultry red. The wonderful luminous hue of the low-dome Carnelians gives the links an inescapable elegance. Crafted by Carrington & Company in 14kt gold, circa 1920. Arts & Crafts moonstone cufflinks, circa 1900. The first five pairs of cufflinks illustrated in this note are from the years around 1925 when bold, eye-popping colors were in vogue. Earlier in the century a softer color palette was preferred. The jewelers of the early 1900s favored pastel shades of enamel and luminous gemstones. The above cufflinks from the Arts & Crafts period feature shimmering moonstones with a subtle bluish cast. The billowy luster of the moonstones ("adularescence" in gemology speak) beautifully plays off the color and texture of the antique gold. Created by Day, Clark & Company in 14kt gold, circa 1900. Recent additions to the Antique Cufflink Gallery include elegant golden acanthus scrolls from Carrington & Company, frosty white octagons by Wordley, Allsopp & Bliss, two pairs of platinum and gold cufflinks featuring sapphires and diamonds, and a striking pair of sultry red Carnelian cufflinks from Carrington. Golden Scrolls Beautifully chased and hand-engraved acanthus leaf scrolls fill these striking cufflinks from Carrington & Company. Crafted in 14kt gold, circa 1900. Winter Jazz Brilliant white gold cufflinks that sparkle with the elegance of the Jazz Age. The frosty white centers feature swag and starburst motifs surrounded by dramatic box-and-cross borders. Crafted in 14kt gold, circa 1925. Sapphire Elegance Bright platinum and gold cufflinks with intricately engraved centers and dramatic scroll borders set with sapphires. Crafted in platinum and 14kt gold, circa 1920. Diamond and Sapphire Elegance Platinum and gold cufflinks elegantly engraved with foliate and lattice designs. Set with small diamonds and rich blue man-made sapphires. Crafted in platinum and 14kt gold, circa 1920. 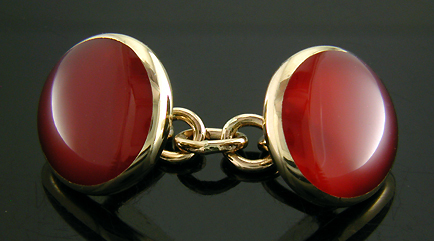 Carrington Red Alluring cufflinks featuring rich, sultry red Carnelians set in antique yellow gold. The luminous glow of the Carnelians imbues these cufflinks with inescapable elegance. 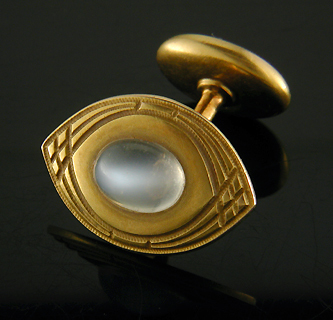 Crafted in 14kt gold, circa 1920.
and pearl stickpin to the Antique Jewelry Gallery.